It’s exciting when spring arrives; everywhere we look there is flourish and bloom. This is true on land, but from our Pacific waters other wonders are springing forth. This is the long-awaited time of year when fresh wild Pacific Halibut season returns and this coveted fish becomes available again — and are we ever excited! Halibut winter in the deepshore waters spawning, and from now until October they arrive in the nearshore waters to feed. 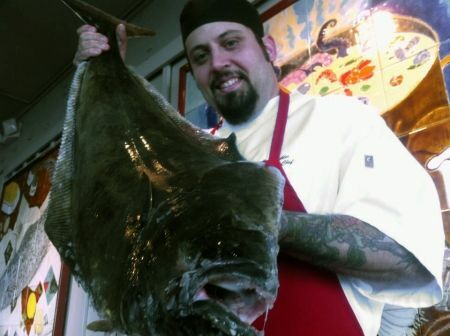 This is when the Pacific Halibut fishery comes alive. Frumpy, flat halibut wear brown camouflage on top, with a white belly underneath. Its fins are strangely located around its perimeter, and it has a huge oversized mouth. Both eyes are on the same side of its face, and frankly it looks like it was run over by a Mack truck. This is no glamour fish, but underneath its unfortunate exterior lies a pearly white, delicious, nutritious, sustainable fish with lots of versatility. Pacific halibut can be found all the way from Alaska to California, east to Russia and then south to Japan. In general the largest — called “barn door” halibut — are found in the deep cold waters of Alaska and range up to 500 pounds in weight and eight feet in length. By the time we get to California, their smaller halibut — called “chicken” halibut — is smaller in size ranging from 4 to 12 pounds. The larger the fish, the larger its muscle mass and the larger the flake of its meat. This size and texture difference results in different densities so halibut can range from a firmer “steak-like” texture to a lighter more delicate fish fillet. Halibut feed on a spectacular connoisseur’s diet ranging from shrimp, crab and clams to octopus, cod and even smaller halibut. This very nutritious diet, and of course its 1,000 mile migration-exercise program, lends itself to producing a very lean, protein rich meat. As far as nutrition goes, halibut is one of the more brilliant foods. It is not only very low in fat, but also low in cholesterol and very low in saturated fat. It has a healthy dose of omega-3 fatty acids, which are an amazingly important nutrient for managing inflammation and promoting good brain and cardiovascular health. The other bonus nutrients are potassium, which helps control blood pressure, and a very high selenium content. Selenium is an essential nutrient playing a role in cancer, cardiovascular and thyroid health — wait, I almost forgot — also in cognitive decline. How brilliant. Right now, halibut is an excellent choice for its wild freshness, preparation versatility, great nutrition and most of all deliciousness. One warning, halibut is easy to overcook, so to make sure you learn how to do it right, come to Salty’s and let our fabulous Fish Chefs remind you how delicious halibut can taste. For a related story on the virtues of halibut vs. salmon, read Kingen’s blog Fish Fight!